I've done WW a few times - I like the online tools to track your eating and exercise - but I've found (and I think I've posted this elsewhere) that the most help WW has been was to show me where I'm going wrong. Breakfast and lunch are usually completely within reason for me...Dinner is the culprit. Workdays are long and I'm usually really hungry by the time I get out of work, which leads to eating out - add a glass or 3 of wine and I've blown the whole day, never mind not earning any activity points. FWIW WW counts 1 glass of red wine as 2 points. So, I'm going to try to eat out less - frequently I divide dinner into two portions and take half home - and have an energy bar or something late in the afternoon with tea so getting to dinner doesn't become so crucial. Tonight is yoga class and I got to work with my gym clothes, so half the battle is won. I used to have a similar problem when I was working and here's how I fixed it. I would take a break from my desk at about 9 or 10 am and have a light breakfast such as an English muffin with egg and a slice of ham or a breakfast burrito. At lunchtime, I would take a walk or join in an exercise class, or maybe run errands. Then, I would work until I felt hunger pangs at around 4 pm and take another break to eat some leftovers brought from home, including any vegetables that were available, a small portion of fish, chicken, or meat, and some pasta or rice. After work, I would go to the library, museum, park, a meeting, or a movie instead of going home and having dinner (my family usually ate before I arrived home anyway). This routine worked extremely well if followed 2-3 times a week. And that's a smallish glass -- 5 oz. (a largish glass, eight ounces, or one cup, is 3 points). I save most of my "bonus points" for wine, because if I tried to stay within my 20 daily points plus have a glass or six of wine I'd be seriously undernourished. One year I tracked every calorie I ate for a couple of months. On days when I consumed no alcohol, I had little problem staying within my designated limit. On days when I did drink, forget it. Mention of energy bars brings me to one of my dilemmas. Is it better to eat a little bit of treat-y food -- energy and fiber bars, low-fat pudding, WW bars and desserts, etc. -- or to stay away from that stuff entirely and limit oneself to fruit for sweetness? Those handy treats can be lifesavers in a pinch, and they're portable and tasty. On the other hand, I find I usually do better losing weight if I avoid all semblance of chocolate or sugar and retrain my taste buds. But this might be one of those individualized things. I had a friend once who lost a lot of weight but throughout the process always allowed himself one treat a day: a piece of cake or pie, some cookies or ice cream. Me, I think I do better trying to lose my taste for that stuff, because it tends to just trigger overeating. On the subject of alcohol, cutting down is a great way to limit calories. A little chemistry lesson: both carbohydrate and protein have 4 calories per gram. Fat has 9 calories per gram. Alcohol has 7 calories per gram. Add ice, water it down, use small glasses, save it for a treat. I like wine with dinner. I find if I have a big glass of water on the table, I'll drink less wine. 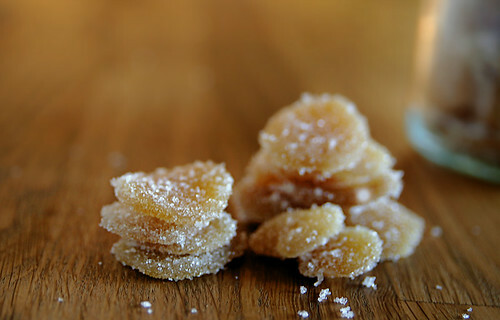 Since I've never liked those energy bars, I've found something for the late-afternoon hunger crash--candied ginger. I keep a jar in my office. When the hunger hits, I take one piece. It's spicy and has a soothing effect on the stomach. Boneless, skinless chicken breast is so versatile. Where I shop, they sell them individually wrapped, so they're easy to use and to freeze. Four breasts were about $9, not too bad. Persillade is a great flavor enhancer. If you add it early in the cooking, the garlic kind of mellows. If you add it at the very end, it keeps the garlic zing. BTW, parsley is the antidote to garlic breath, so I wonder if they cancel each other out? Paul - where's a good place to buy candied ginger? Is it in the baking items aisle? Katherine - I suppose the sweet/treat thing might be individual. I rarely have sweets in the house and haven't hit the vending machine here at work once in 9 months...I am tempted by restaurant desserts once in awhile, especially if I've had whine (and thanks, Paul, for the calories per gram sanity check). My weaknesses are dinner-style carbs like pastas and rices instead of desserts, though of late I've been craving meat, which I think is my body telling me I'm not getting enough protein. I like theirs, because it's fresh, and very spicy. It comes in cubes, but I like the discs. Also, Trader Joe's has their own brand. Whole Foods sells it also. Yes, I have heard they are high in sodium. And as a general rule, I agree with Lee that processed food is less than ideal, health-wise. I don't think anybody would disagree about processed foods being less than ideal. Here's a sodium anecdote--which also shows, I think, how important it is to be an avid label reader in the supermarket. I was enchanted by those TV commercials for that microwavable chow mein--the commercials with the little Chinese guy, "Eddie, from accounting (I'm having a senior moment as to the brand. ). I found the product in the supermarket, read the sodium content, and thought I'd have a stroke just from reading the label! I've never tried any of those energy bars. I've heard they're high in fat; or is that just granola bars? I also keep hearing advice to eat a number of small meals through the day instead of the traditional "three squares." As for treats, in ordinary times--I mean not around the holidays when I'm trying to work my way through too many edible gifts just to get rid of them--I permit myself three dark chocolate Hershey Kisses a day when I get home from work. That way I have the treat to look forward too, and I don't feel that I'm depriving myself of chocolate, but I'm also not going on a binge and stuffing myself with it. I think those actual "energy bars," like they sell in health-food stores or the vitamin aisle, are high fat. So are granola bars. But fiber/nut/fruit-type bars -- the ones in the cereal or cookie aisle -- vary widely, and some are pretty low fat and/or high fiber. As I mentioned somewhere else around here, I brought home some boxes of WW snack bars over the holidays, and they're delicious. Only one point apiece. Then again, I could eat four of them. But I credit them for minimizing my consumption of Halloween candy, Christmas cookies, etc., since October. My son likes the red velvet ones; I'm partial to the chocolate caramel.